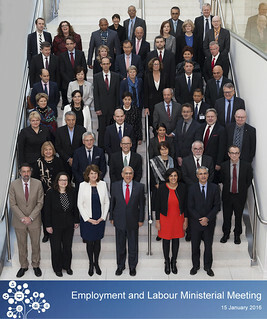 On 15 January 2016 Ministers from over 40 countries will gather at the OECD Headquarters in Paris, France, for the OECD Employment and Labour Ministerial Meeting. The Ministerial meeting will take place under the chairmanship of Ireland, with Chile, France and Germany as Vice-Chairs. The overarching theme of the meeting is “Building More Resilient and Inclusive Labour Markets”, covering issues that are high up on the policy agenda of all OECD and major emerging countries with which the OECD has a growing partnership. The morning session of the Ministerial will focus on how labour market policies can play a key role in “Promoting greater labour market resilience and inclusiveness”, and will give Ministers the opportunity to discuss policies and to share experiences on programmes for helping under-represented and disadvantaged groups in the labour market connect with quality jobs. Over lunch Ministers will discuss the key issues that should be taken up in a review of the OECD Jobs Strategy as a key reference framework for guiding employment policy. The afternoon will be devoted to specific policies that are needed to make labour markets more resilient and inclusive, and will be divided into three parallel break-out sessions: (1) Enhancing the quality of working lives and work-related well-being; (2) Skills for resilient and inclusive labour markets; and (3) Addressing inequalities in the labour market. The Ministerial meeting will be chaired by Ms. Joan Burton, Deputy Prime Minister and Minister for Social Protection of Ireland. The Vice-Chairs are: Ms. Andrea Nahles, Federal Minister of Labour and Social Affairs of Germany; Mrs Myriam El Khomri, Minister of Labour, Employment, Vocational Training and Social Dialogue of France; and Mr. Pedro Goig, Director of the National Training and Employment Service (SENCE) of Chile. The Ministerial meeting will provide opportunities for a rich exchange of ideas and experiences on how to build more resilient and inclusive labour markets. The Ministerial meeting will serve to identify priority topics for future OECD work on employment and labour market policies.